Woo hoo! It’s officially Christmas time! Now all you Scrooges can stop complaining about hearing Christmas music before Thanksgiving. Speaking of which, we had a small and lovely family Thanksgiving. We were so laid back that I didn’t even take pictures. The only turkey I snapped was this one, who turned one-half on Thanksgiving Day. Talk about feeling thankful. Okay, friends, let’s talk about this QUICHE. A year ago (! ), Eleanora & I went over to our buddy Hudson’s house for his 2nd birthday party. Hudson and Eleanora met at Toddle Tunes when they were just six months old and instantly bonded when they discovered they shared the same birthday. I mean really… have you ever been to an event where a quiche was the star? Me neither. But it was that good. Cristina had gotten the quiche from Thyme Cafe in Santa Monica, up the street from her house. 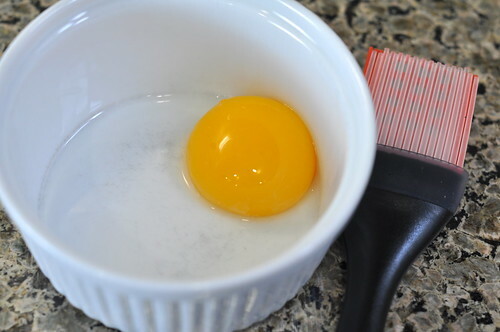 Inspired, I thought I’d try making my own quiche at home. 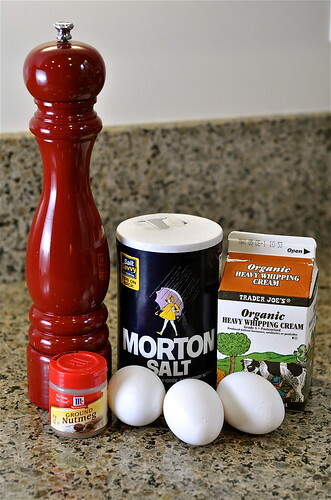 For a long time I had this idea that quiche must be complicated to make. But it’s actually so un-complicated that I’m even putting it on the Easiest Dinners Ever page because, in my house, we often eat quiche — famously a brunch dish — for dinner. 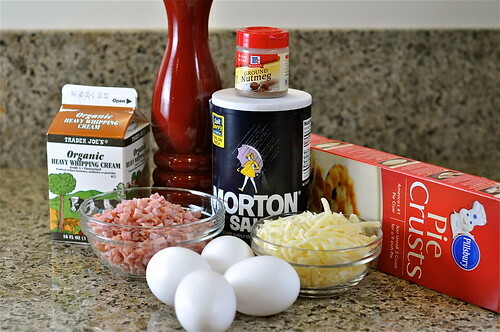 This recipe is simple simple simple, and really easy to adapt so that you can make whatever kind of quiche you like. I have done bacon & cheese (though according to the Joy of Cooking, Quiche Lorraine is just bacon — no cheese), ham & cheese, and spinach & caramelized onion. My favorite is far and away the ham & cheese. It’s rich and lovely and creamy and flaky and golden-tasting. It’s so easy that you can throw it together for a weeknight dinner alongside something green, such as a salad with vinaigrette, haricots verts (pdf), or sugar snap peas, and a glass of chilled white wine. 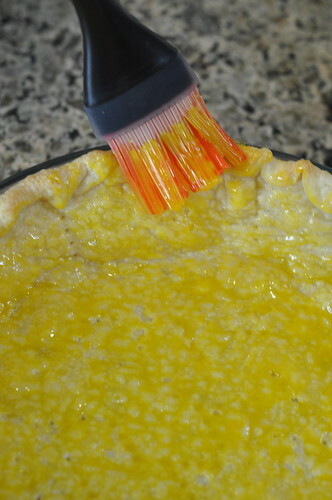 Brush the baked pie crust with the egg yolk. 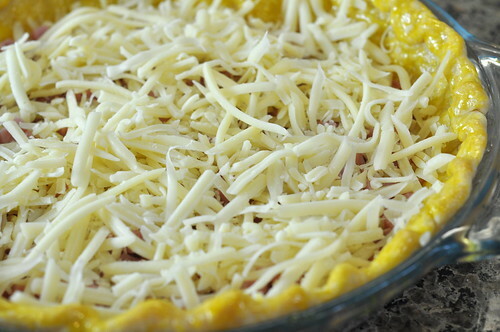 Spread the ham on the bottom of the pie crust, then top with the grated cheese. 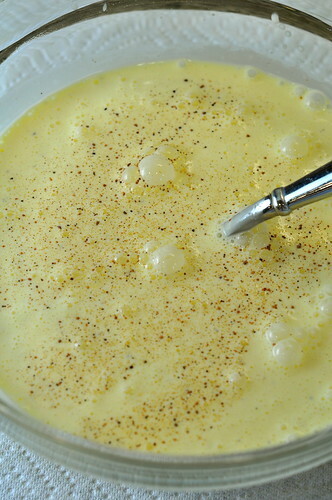 In a mixing bowl, whisk together the 3 whole eggs, heavy cream, salt, pepper, and nutmeg. 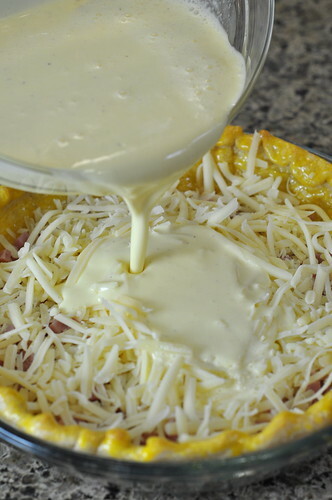 Pour on top of the ham and cheese. 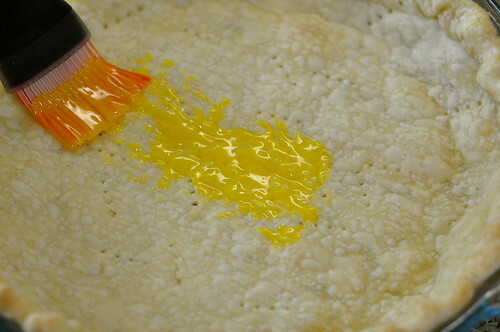 Bake until the filling is golden brown and set. Joy of Cooking says this will take about 25-35 minutes, but my oven takes closer to 45 minutes. 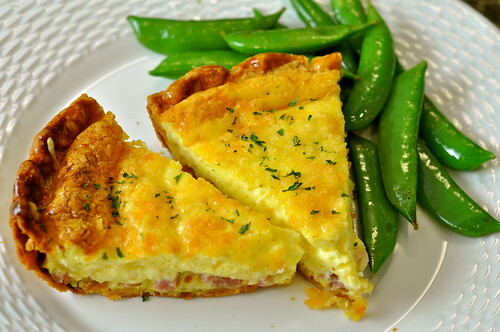 * For traditional Quiche Lorraine, omit the cheese. 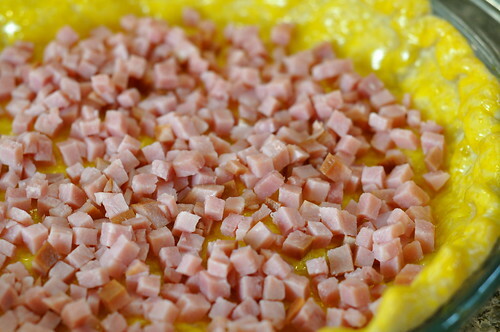 Substitute 4 slices of bacon (sliced into 1-inch pieces and then cooked) for the ham. 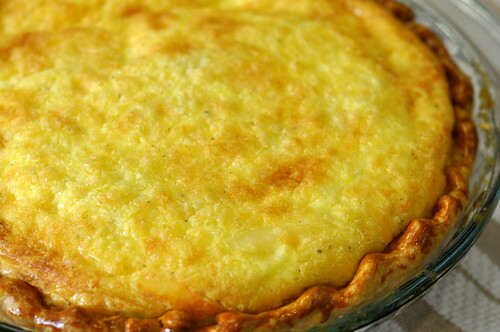 ** You can bake the pie crust the day before in order to save time the day you are serving the quiche. 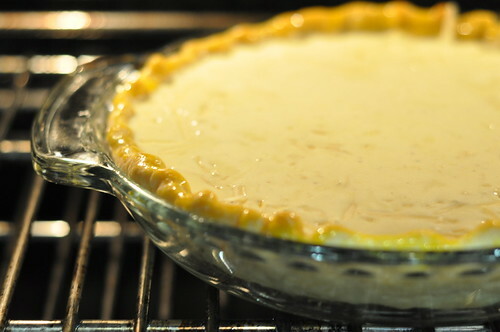 Allow the baked pie crust to cool completely, then cover it with aluminum foil and store it at room temperature. I think I’ll add this to our Christmas brunch! Sounds yummy! Thanks for sharing. It is going to be dinner tonight! Thanks Hannah! I’m so glad! Thanks for the feedback!